Drywall or sheetrock is found in most homes and even businesses throughout Jacksonville, FL. Many will need drywall repairs due to abuse, water damage, scuffs and prior to interior painting. Interior drywall repair is a specialty of Pro Color Jax. Including custom textures such as knockdown, etc. ​When undertaking an interior painting project it's always a good idea for the painter to go over your drywall very carefully before painting. You'll want to attack any drywall repair issues prior to interior paint finishes going on, as to ensure a beautiful - consistent finish. When drywall repairs are accomplished by a true craftsman, they shouldn't be seen; almost non-existent. He will be able to blend the drywall repair perfectly so the eye is not drawn to the fresh repair. Be wary, not all can perform drywall repairs as such. ​Contact us for your interior drywall repairs and experience the best drywall repair company in Jacksonville! The process for most drywall repairs is to clean and inspecting the area. All the while looking for stains, moisture, mold, inside wall damage, lifting tape and if big enough; looking inside wall for structural damage. The level of damage to the drywall will vary; this dictates what drywall repair method will be used. A few key factors to watch for are: Be sure the "plug" or insert he will mud to is secure. Also, make sure the drywall repair gets sheet rock tape on larger holes & seams. In addition, deep or larger holes patch should be applied in multiple coats to eliminate popping or cracking. This happens when drywall mud is rushed & applied too thick at once. Drywall repairs are a daily occurrence for us; having completed 1000s of drywall repairs; you can trust us with drywall repairs. A lot of Jacksonville drywall repair companies can do the repairs; but blending textures to the existing texture is an art. We blend drywall repairs in Jacksonville and blend the texture on ANY existing surface! This comes from doing texture and drywall repairs for over 25 years. In addition, we offer custom texture application to your interior. These custom textures are highly sought after and can raise your home's value when applied correctly with an interior painting project. 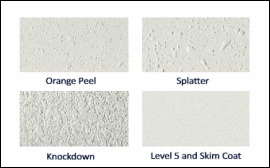 Some of the textures we offer are: orange peel, popcorn or popcorn removal, smooth, knockdown, spanish lace, splatter, Venetian plaster, combing, etc.